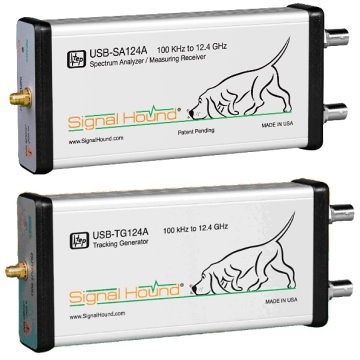 The Signal Hound USB-SA124B is a Software Defined Radio (SDR) optimized as a spectrum analyzer. It operates from 100 kHz to 12.4 GHz with a wide dynamic range from -151 dBm to 10 dBm and a 6 MHz resolution bandwidth. The USB-SA124B is powered by a USB port, eliminating the need for a separate power supply. The USB-TG124A from Signal Hound is a USB-based tracking generator that operates from 100 kHz to 12.4 GHz. It works with the USB-SA124A spectrum analyzers to measure filters, attenuators, amplifiers and other components to carry out scalar network analyzer measurements. Czy tego już nie było ? Był ale jest teraz nowy, pracujący do 12,4 GHz!! !